We’re aware of some issues with the Leadbolt component which will be fixed in the next update. Which Android version are you using? I don’t think the current version of the component is compatible with Android Oreo. @Mrtaih_Mrtaih we’ve just released an update which fixes some issues with the Leadbolt component. Could you test it and let me know if you’re still having trouble? 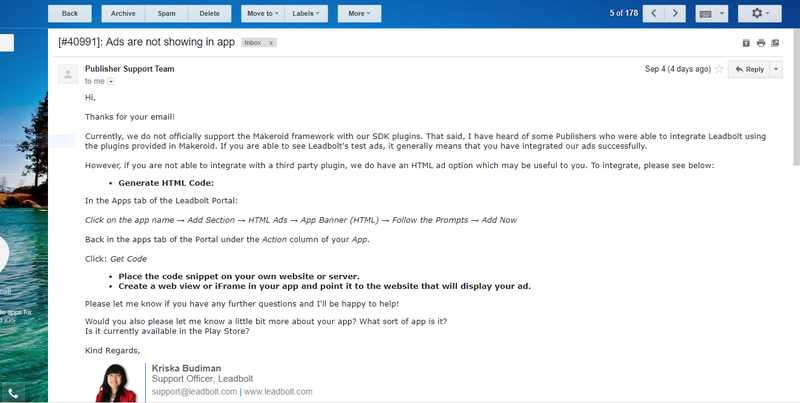 This is a know bug by all Makeroid Community and the developers are working on fixing them! Hello, is the component now compatible with android O or it still isn’t? I’m trying to use it on my device running Android 8 and it doesn’t work. Gonna try ASAP on an Android 6 device and tell the result.